Brave and beautiful, 'The Fountain' is one of the most striking and most wonderful films I have ever seen in my entire life. This experimental narrative impresses and indulges. It is such an organic opus for director Darren Aronofsky... and I really salute every single person involved in the making of this film. More than being an audio-visual masterpiece, this open-ended, surreal, and lingering within human's stream-of-consciousness film triggers a world of visionary artistry stimulating not just the eyes and ears - it goes down to a human being's very senses until it reaches the core of the soul. A haunting and remarkable journey that takes a viewer to various places and levels of consciousness, 'The Fountain' addresses such a metaphysical, emotional, and spiritual topic by utilizing an instinctive human language of pure cinematic poetry. Indeed, it gives that mystical, astonishing, and evocative film experience. I do know that this film won't affect every person watching it the way it struck me, but surely, at one point, every person who gets to watch this film will get a knock on the door of his/her soul... with lingering questions about love, life, and death... Some of the people from behind me at the moviehouse have actually called it weird. Maybe it is... and maybe I just share the same wavelength with such a vision that's why I have appreciated it so much... but with all conviction, I do believe that if a person opens his/her mind to the 'weirdness' that they call, this cinematic poem will surely tap the subconscious into some miraculous transcendence. It will make the viewer wonder, question, and evaluate the unanswered inquiries he/she has since his/her childhood days... The film will not impose a concrete answer - but the magic of it is that it makes the viewer think and absorb the experience to think and act for the more important things in the present life than getting the concrete answers to the questions left unanswered since time immemorial. Some may find it a soothing and suiting meditation on love and life, on life and death, on struggling and accepting, on beginning and end. It works in many levels. The splendid visual, sound and music elements, the enchanting storytelling, the taut acting, the powerful direction... together they make up this masterpiece. With each rhyming images and visual metaphors, every beat and unit of the actual film are carefully threaded together to give a tap to the soul and its lifetime of inquiries - its very idea may go beyond the scope of human understanding; but its emotional force really surfaces effectively to bequeath that mystical, soulful experience. 'The Fountain' is a risky and yet uncompromising cinematic work. Aronofsky tries to replace the prose of the already marked narrative storytelling by coming up with three distinct themes that gradually come together in a movement that is both powerful and beautiful. It's a thought-provoking, emotionally honest drama that is steeped in love and loss. And with its time-spanning love story, it is inventive in using organic means to come up with much of its special effects; thus, creating a more organic and dynamic feel to it. Furthermore, the film pushes the audience's flights of imagination into new facets and dimensions. Indeed, Aronofsky displays such an admirable film discipline. He proves that film is a really powerful medium, and even though the formula conquers the motion picture industry, a filmmaker can still live up with a unique language that is challenging and refreshing - and this is such an achievement. Noticeably, in the film's flash website under Warner and the write-ups/PRs directly coming from Warner, I would have to agree with Aronofsky advocating the idea that the people working for the film are all filmmakers. It is such an honor to share some similar insights with one admirable filmmaker as him. And one of these insights, I can not let pass not saying here... I have publicly said in one of my film reviews before (from my film review of the Filipino film entitled 'Ilusyon'), that in any filmmaking endeavor, every person, whether working in front of the camera or behind the scene, is a filmmaker. I know this is fair enough to understand; while elaborating with this would probably need a new article/essay to write about. The sterling performances from its actors and actresses are splendid. Even the minor characters not uttering much dialogues show distinctly effective roles with their few seconds of screen time. And of course, the two main characters wonderfully validate the film's vision. This is a film anyone seeking a truly original experience at the cinema should partake in. 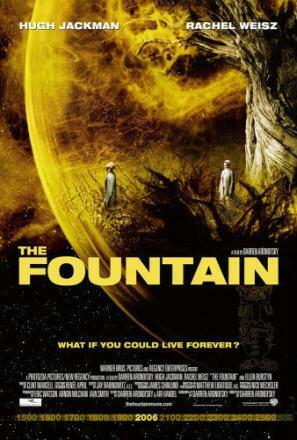 Personally, 'The Fountain' goes along with films like 'Pi' (Aronofsky's first feature), '2001: A Space Odyssey' (from the late film genius Stanley Kubrick) and 'Solaris' (from insightful filmmaker Steven Soderbergh). Just like these classics, 'The Fountain' is hugely ambitious and visually commanding, misunderstood by many, and respectively underrated. It has a complex impact that defies mainstream's overused receptivity. With this profound work, Aronofsky speeds back and forth across centuries with such virtuosity. He is a visionary director. And he is one of the rare filmmakers offering up such a challenging vision to a mainstream audience without playing safe and making much pretentions. Also, it is interesting to note that no spoilers can mainly affect every single film experience one can get in this motion picture. The only thing that becomes a little more 'improvable' (pardon my lack of a better term for now) - as for how it struck me then - is the presentation of the future Tommy who is an astronaut in a bubble-looking spacecraft. Actually, I can clearly appreciate the point that Tommy's various incarnations are being presented with the distinct position/profession complementing the eras that they live: a conquistador, a scientist, and an astronaut. All of them work effectively to the idea that Tommy's soul explores and seeks answers for all those lifetimes. However, while watching the film, it has never gotten into me that the future character is actually an astronaut... I am not completely sure if there is something I missed to further understand its deeper roots, or maybe it will just come in time for me after carefully digesting the story, or maybe it will get into me only after watching it again... I have actually gotten the fact that he is an astronaut only upon reading the film's synopsis. I just missed that with me thinking that the astronaut character is actually a person from the future who is meditating, and at the same time, struggling in his sacred space. Well, I guess, just like any other true work of art, there are things that can become a little missed by a spectator/appreciator. (Sometimes, I just wonder if I might then be a poor victim of the too conquistador clichés, too scientific interpretations, and too objective approaches seeking for much literality for the images I see...) Nevertheless, this is another interesting part - that my mind further gets stimulated with it while initially thinking and evaluating the film. Personally, it is my dream to make a film that can weave the various cultures of the world and impart a universal message. And it is impressive to note that 'The Fountain' achieves this dream. And as a part of the audience drawn by its brilliance, it is so wonderful to see a collaboration of concepts from science and religion, art and science, and physicality and spirituality within one 'whole' film. Furthermore, it is fulfilling to see all the elements of drama, romance, fantasy, and sci-fi all in the right places as it crafts such a marvelous piece of work. Just like a friend of mine saying, 'Either you love it or hate it,' and I would have to agree with that, this film is definitely not something for everyone, as a lot of people will probably think it's too difficult or eclectic. It can probably get underappreciated by most. But come to think of it, it's not a matter of extracting mathematical results from the story. Its very essence would like to make people feel and experience... and think. And if a viewer just opens, at least, a curtain from the windows of their mind and hearts, they can later on embrace the totality of the film experience... and that's where some form of appreciation and fulfillment comes... In another manner of saying it, one can appreciate it in a similar way as appreciating a poem or an impressionistic painting. The Music of Middle Earth - an Analysis on the Use of Music in the Film: "the Lord of the Rings: the Fellowship of the Ring"